We ship the granola in boxes. A box of granola contains 4 packages of granola. Each package contains 350 grams of granola. One box (4 packages) costs $34.96; this price includes shipping and handling. Same instructions apply when ordering our Garlic Chips (210 grams in one package, $7.50/package). Mix and match the types of products you want, but to complete the order you must order products in increments of four (4, 8, 12, etc.). 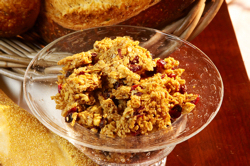 Baked Granola - Our original granola loaded with the following healthy ingredients: raisins, cranberries, almonds, peanuts, walnuts, flax seeds, sunflower seeds, oats, and a touch of honey. 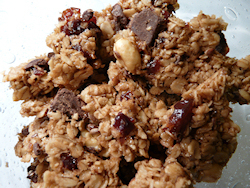 Chocolate Cherry Granola - Rich chocolate and tart cherries blended together with oats, honey, walnuts, and almonds. Fruit Blend Granola - Made with the finest fruit from the United States: dried cherries, dried blueberries, dried cranberries, and raisins. 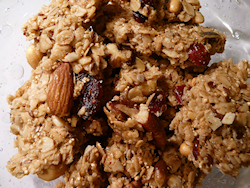 Nuts & Seeds Granola - Packed with the following nuts and seeds: amaranth, almonds, flax, peanuts, pecans, pepitas, soy nuts, sunflower seeds, and walnuts. 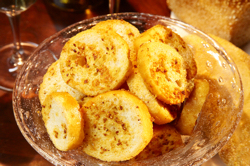 Garlic Chips - Slices of our French Baguette bread sprinkled with garlic, olive oil, and butter. White Chocolate Peppermint Holiday Granola – A holiday treat with Belgian white chocolate chips combined with a subtle blend of peppermint and vanilla. Fruit Bars - These all natural fruit bars are available in four different flavors: raspberry, apricot, cherry, and blueberry. They are great for breakfast or for any time of day. *These products were processed on machinery that may have been used to process products containing nuts, eggs, peanut butter, soy, and dried milk.